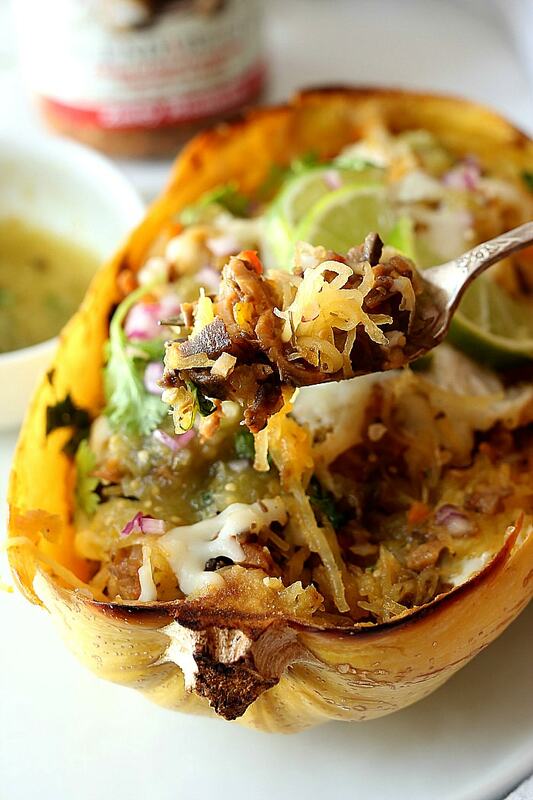 Healthy low carb spaghetti squash baked & stuffed with zesty Mexican mushroom salsa, roasted salsa verde, red onions, and cilantro gives this dish delicious flavors! It is vegan, gluten-free and low carb, catering to most diets. This is a sponsored post from BLENDABELLA written on behalf of me. All opinions are mine and I only support products I love and use myself. 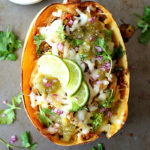 This Mexican baked spaghetti squash is a delicious, healthy low carb easy dinner! Lately dinner time has gotten stressful as so much is going on in our lives and I have not wanted to mess with cleaning extra dishes. Should I even begin to tell you about the giant stack of clean clothes that have not gotten folded in weeks? Time is valuable to all of us and dinners should be fuss free. 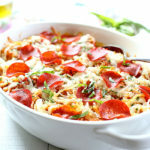 That is why I am starting a series of one pan dinners that are quick, easy, low carb and healthy. 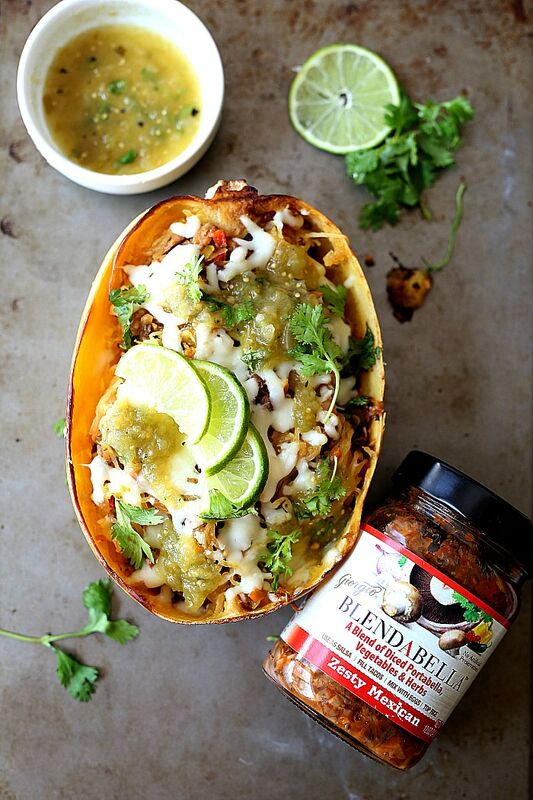 Starting with this zesty Mexican mushroom low carb spaghetti squash! Spaghetti squash is a staple item vegetable that I make sure to always have in stock. In fact, I have a roasted spaghetti squash sitting in my refrigerator right now to heat up for a quick dinner tonight. Can I cook spaghetti squash in advance? This spaghetti squash recipe can be made in 30 minutes or less by cooking the vegetable squash ahead-of-time, either in the morning or night before. To store it, leave the noodles in the squash after cooking or remove the seeds and then store the noodles in an airtight container. 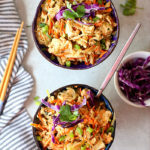 If the noodles are removed from the skin it can simply be baked in a casserole dish instead of the skin when ready to use. There are a few methods to cooking spaghetti squash which you can view here the details. 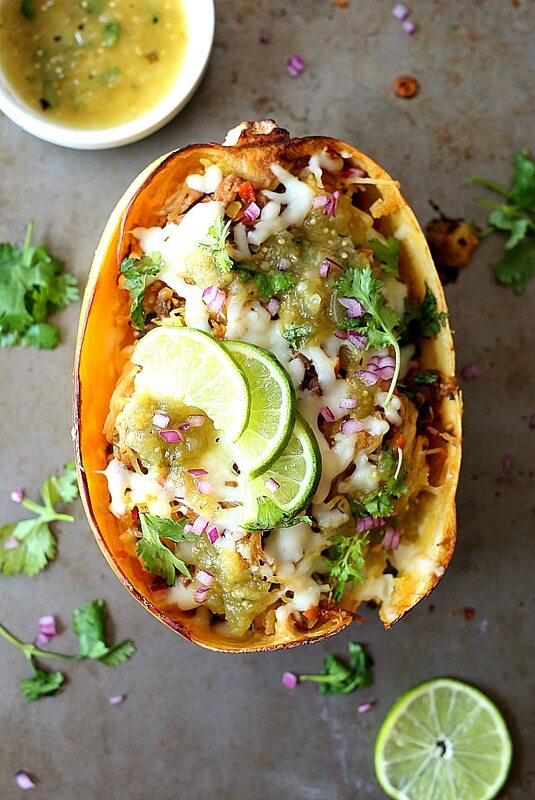 Cook the spaghetti squash in the slow cooker. My preference of choice is to roast the squash or microwave. To save time it can be microwaved whole (poked with a knife first) for about 12-15 minutes depending on the size. Then slice it in half and remove the seeds before “fluffing” the noodles with a fork. 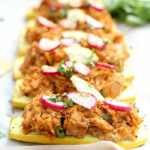 What makes this a low carb spaghetti squash dinner? This entire dinner is made of vegetables! Except if you add the cheese? Vegetables are low in carbohydrates and calories and rich in fiber. One cup of yellow spaghetti squash contains as little as 7 grams of carbohydrates and 31 calories (of fuel). The blend of diced portabella, vegetables and herbs contains as little as 3 grams of carbohydrates per 2 tablespoons. These carbs are healthy carbs that turn into fuel the body needs for sustainable energy. 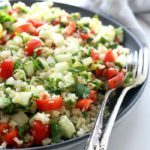 This meal is made with 4 Simple Healthy Ingredients! I have been loving BLENDABELLA’s different blends of mushrooms, vegetables and herbs such as Zesty Mexican, Coconut Thai and Rustic Italian. They are an easy, healthy sauce that can be tossed with eggs, into burritos, over pasta or pizza and I like to use it in this spaghetti squash recipe. It’s pretty much a winning meal because there are hardly any dishes used in the preparation! Mixing the sauce in the spaghetti squash eliminates a baking dish. Top with freshly grated cheese, this roasted tomatillo salsa verde, and fresh onion and cilantro! You can control how much cheese you like. The salsa is slightly spicy so for kids try adding a little and lots of cheese. My hubby and I love this with melted cheese, my half being vegan cheese and the kids and his using Monterrey Jack or Mozzarella. The best part is you can be creative with how you like it! Thank you BLENDABELLA for sponsoring this post. You can purchase BLENDABELLA online here, and visit them at Facebook, Twitter, Instagram, Pinterest and their website. Microwave: Poke the spaghetti squash with a knife. Cook in the microwave on high for 12-15 minutes until soft in the center. Let cool enough to handle. Slice in half and scoop out and discard the seeds. Using a fork "fluff" the inside of the squash to resemble noodles. Roast in the oven: Slice the squash in half and scoop out and discard the seeds. Drizzle with olive oil and flip each half over on a baking pan so the flat side is facing down. Pour a dash of water on the baking sheet. Roast at 400 Degrees F for 35-45 minutes until it is soft when poked with a fork. Let the spaghetti squash cool slightly before handling and flip over and with a fork “fluff” and scrape gently out the noodles. Add 1/2 - 1 jar of BLENDABELLA mushroom sauce to each half cooked spaghetti squash. 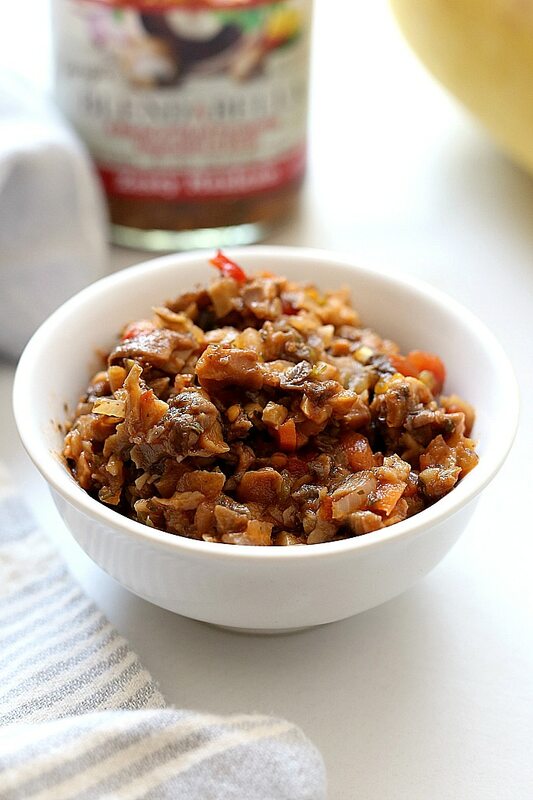 Use half a jar for less spicy and a full jar to each half for a spicier dish. Top each half with 1/2 cup of shredded cheese or blend it together inside. Bake for 5-10 minutes until the cheese is melted. Garnish and serve with fresh salsa verde or red salsa, cilantro, red or green onions before serving. Optional to add a squeeze of fresh lime. Can add more cheese if you want a cheesier version:-). Recipe nutritional information is without the mushroom salsa.